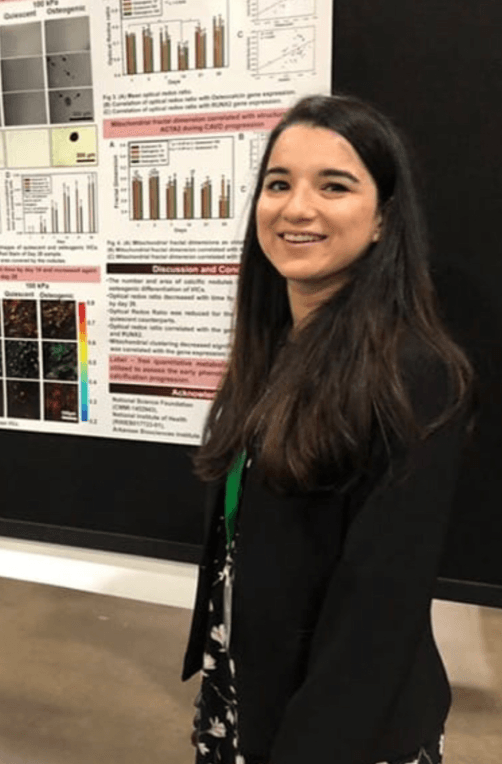 Ishita Tandon is biomedical engineering doctoral student at the University of Arkansas and a recent recipient of the American Heart Association fellowship. In the Q&A below, she discusses her history with biomedical engineering, work-life balance, mentorship under Dr. Balachandran and collaborative research with Dr. Kyle Quinn and his lab, among other things. UArk BME: Did you always know you wanted to study biomedical engineering? Tandon: Yes, I did! My parents are both doctors. My dad is a plastic and cosmetic surgeon and a burn specialist. I grew up with the idea that there is a dearth of affordable and sustainable skin scaffolds for burn patients and I wanted to do stem cell research and come up with a solution. Therefore, I took up biotechnology as the optional subject during my high school and did my undergraduate in biotechnology as well. After that, I came up here and have been enjoying my research as a PhD scholar. UArk BME: You were recently awarded the American Heart Association Fellowship for your research into calcific aortic valve disease. Congratulations! What drove you towards this research? Tandon: The research proposal we submitted for the American Heart Association Fellowship deals with using multiphoton imaging as a tool for early detection of aortic heart valve calcification. Our lab researches the early mechanisms involved in the aortic valve calcification. This research is important as the diagnostic technologies used in the clinic like ultrasounds, diagnose the disease at a later stage when irreversible damage has taken place. So, we wanted to come up with detection tools that applied to the early stages of the disease so that the intervention could be made before irreversible damage of the tissue occurs. In addition, Dr. Quinn had the technology of multiphoton imaging, which had applications in cancer and stem cell research. Therefore, we collaborated to see if the technology could be used as an early detection tool and be applied in the heart valve disease field as well. UArk BME: What’s a typical day like for you as a PhD student? How do you balance the demands of your research with other responsibilities? Tandon: Usually, my day revolves around the research. I try to be home by evenings and not spend odd hours in the lab, to maintain some work – life balance. The way we set expectations in our lab is by setting deadlines to get the research goals completed, irrespective of how and when we get it done. This setup gives us the flexibility of working at our own pace and time and enhances our productivity and work quality. It also helps us maintain the balance and get some personal time. UArk BME: What made you choose the University of Arkansas for graduate school? Tandon: I loved the fact that it was a new and growing department and the research projects going on were exciting. I had initially applied for a master’s degree. Dr. Kartik offered me a PhD position and I was intrigued when we discussed about the research opportunities. I was also drawn to the peaceful and serene vibe of the town with a nice climate. UArk BME: Your research specifically focuses on early detection methods. Could you elaborate on what this research entails, and how it will help those diagnosed with the disease? Tandon: Our lab focuses on creating multiscale platforms like 2-Dimensional or 3-Dimensional organ-on-chip models, animal models and biomaterials for tissue engineering applications. For my research, the organ-on-chip device and the animal model is used to simulate the healthy versus the diseased condition of the valve. The cells and tissues are then imaged using the multiphoton microscope and metabolic readouts are obtained. The goal is to correlate those readouts with the metrics, which are established in the literature in order to test the hypothesis that the multiphoton metrics could be used for early detection of the aortic valve calcification. My study serves as a proof-of-concept and would need rigorous validations before it can start benefiting patients directly. I believe, in short term the metric would be more useful in research to enable a longitudinal study in-vitrowith repeated measures given the fact that the imaging technique is non-destructive, label-free and provides quantitative data. Eventually, with the minimization of the imaging setup and further validation of the metrics, this detection strategy, may have a shot in clinics. UArk BME: Which faculty members have you worked most closely with in your research here? What has it been like working with them? Tandon: I work in the mechanobiology and soft materials lab with Dr. Kartik Balachandran. I feel blessed to be under his guidance. I hope to pursue a career in academia and Dr. Kartik is the ideal mentor and professor. He serves as a role model in terms of a lab PI, a professor, an administrator and a mentor. Having that mutual respect and understanding is pivotal when it comes to such demanding undertakings as a PhD. For my current project, I have closely worked with Dr. Kyle Quinn and his lab. I enjoy their work ethic and determination. He gives us the extra push that is sometimes needed to speed things up and realize that we are competing in a highly competitive industry. So many times Dr. Muldoon and Dr. Wolchok have helped me and guided me through questions about microscopy or statistics. The professors in this department make it a safe and peaceful environment to be productive, train yourself for the future and not actually feel the pressure of outside world. All the professors are supportive of each other’s research and the overall development of each student. UArk BME: What have the greatest challenges been in you research work so far? How have you overcome them? Tandon: One major challenge I have faced is that I get excited about all the cool research going on that it gets difficult to focus on one project. I want to take them all on. I want to learn all the different concepts and techniques and be a part of as many projects as I could. I tend to take new projects on without really finalizing the previous ones. The way I am trying to manage it, is by realizing the fact that the research associated with your name is the one that is published and materialized. We need to keep in mind that what we are doing as scientists is in long term for the benefit of society and needs to be accessible to them in some published form. I know many students suffer from the same issue on different levels and at some point we have to commit and see a project through, despite all the troubleshooting and technical challenges it entails. UArk BME: What’s your favorite part of being a PhD student at the University of Arkansas? Tandon: Umm, everything. I can list a couple of them. UArk offers something for everyone. Whatever our taste be in terms of reading, sports, music, arts, science, there is a place for everything. I have always loved to be a part of the extra-curricular activities and respect the fact that there is so much to do here when I need it. I also appreciative that our BMEG department is a small family unit where we all work and enjoy together. We have had activities like ping-pong tournament and department outings. People get along and strive to succeed all together. UArk BME: Do you have any advice for undergraduates who might wish to pursue a graduate degree in biomedical engineering? Tandon: In my experience, two most important things as an undergraduate hoping for graduate school are 1. having a strong understanding of the fundamentals and concepts in the field and 2. getting research experience in a lab. The grades drive the study patterns of most students and they tend to cram up and selectively study to just get the desired grades. I feel the focus should be to understand the concepts and soak in the knowledge. Academics is like a growing tree. If the roots are deep and strong, the tree is going to flourish and fruit well. For someone aspiring to pursue a graduate degree, they should definitely get some lab experience. The earlier during the undergraduate the better are their chances to be a part of the publications, to make them competitive for a graduate position.